Welcome to all the new subscribers this week. I’m so happy to see the blog grow each week as it offers me the opportunity to help more people. I do hope that you will join my many loyal readers who report that reading The Positive Habit Blog every Monday morning helps to put them into a positive frame of mind and to focus on what really matters in their lives. I’m currently handwriting this in a notebook as I am on the most amazing yoga retreat on the Head Of Kinsale. It is a ‘digital detox’ weekend so I’m really enjoying the freedom of having no emails or social media! The retreat is being run by the lovely, inspiring and very positive, Miriam Kerrins Hussey. If you don’t already know her work, I suggest that you take look here. Miriam is a qualified Pharmacist, Integrated Wellness and Nutrition coach and, oh yeah, a yoga teacher! She has an incredibly holistic approach which is wonderful to see in today’s over medicated world. Yoga is my medicine and for me, this is a little bit of heaven – to have an entire weekend dedicated to nothing but mindful movements. The stunning landscape stills the mind and brings a calmness that is so healing to my usual, busy city life. If you are not crazy about yoga, you can still benefit from yoga’s most powerful tool, the breath. The breath is a powerful vehicle for calming the body. If you want to feel calmer, breathe deeper – so simple but true. A calm body calms the mind. Many of us mistakenly try to use the mind to calm itself. This is a little bit like asking a toddler to calm down! Using the mind to calm itself doesn’t work as the mind is a thinking factory and once we are in a world of thoughts we have lost the ability to calm and soothe ourselves. So, this week if you feel like a little break from the busyness of your life without having to go on a retreat, take a step back, take some deep belly breaths and you will become just as zen as any yogi! Please see below for the latest video from The Positive Habit – Anxiety Free – Stress Free in which I discuss the important point that ‘Anxiety is Not Your Fault.’ I hope you are enjoying the new videos each week and if so, please do share them with anyone you know who could benefit. 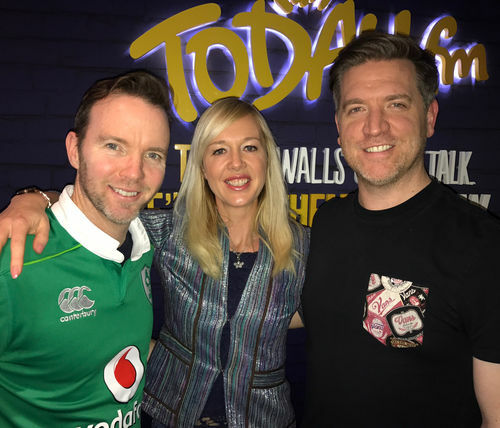 I’ve also included a link to the ‘Mind Yourself Now!’ item on Today FM with Dermot and Dave last Monday. As always, I am also happy to get your feedback. ‘Mind Yourself Now – Emotional Eating?’ If you missed last week’s show, you can listen to the podcast here. I talk about the roots of emotional eating and how to avoid the pitfalls of seeking comfort in food.